Spread a baby blanket scented with baby powder or lotion on your lap, then let your pet rest on your lap to feel the baby moving inside you. Pet and talk to the animal to reassure him. Several times a day play a short recording of a baby’s crying; talk calmly to your pet while the tape is running. As your house and/or baby’s room fills with clothes and furniture, allow your pet to sniff and inspect everything. Have a friend or relative bring their baby to your house. While someone holds the baby, carefully allow your pet to see and smell the baby; for safety’s sake, you should hold your pet during this visit (a friendly dog can simply get overexcited, for example). If you have any concern that your dog will misbehave when he first meets your baby, you should plan to have him muzzled or on a leash. If he’s not accustomed to these devices, use them periodically now — but don’t limit their use to times when you’re familiarizing him with baby’s world. It’s hard for most dogs to get used to a muzzle, and it may take some time before the animal is comfortable with it. Victoria L. Voith, DVM, PhD, and Peter L. Borchelt, PhD, of the Gaines Dog Care Center, in Chicago, recommend that you and your dog attend obedience classes months before your baby is due. 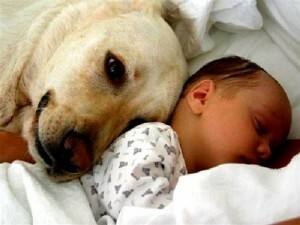 An uncontrollable dog can easily injure a baby, just by accident. “It’s important that the mother attends the classes,” adds Linda Votaw, DVM, of the Rosewood Pet Hospital, in Rosewood Heights, Illinois. Dogs are most likely to obey a man’s deep voice, so classes will probably be most helpful if they train the dog to listen to Mom too. This is especially true if your spouse usually gives the dog commands but you (or later, a female caregiver) will be the one home alone with baby and dog. Feed your pet prior to baby’s arrival home; he’ll be in a better mood after a meal, and more receptive to meeting the baby. And he’ll also be more receptive to your baby if she’s not crying when they meet. Talk calmly, and offer petting, praise, and treats for good behavior. Do not force the animal toward the baby.